Astronomers: Has an APOD image ever helped your research? This thread is intended for publishing astronomers. My question is: has a previously unknown image that you first saw on APOD ever helped to advance your research? I have heard a few anecdotal stories of this happening, but I am wondering if there are cases that I don't know about. One scenario might be a deep and wide image taken by a talented amateur astrophotographer that shows some aspect of a galaxy or nebula that was unknown to you and that you were able to use subsequently in your research. Surely other scenarios are possible. I am interested in accumulating a few cases of these to discuss as future astronomy meetings in an attempt to show that APOD has shown some value in the citizen science realm. To contribute, please either respond to this post or send an email to "nemiroff at mtu.edu". Thanks to anyone who can contribute! This APOD did inspire me and my colleagues to write this paper published in the peer-reviewed Modern Physics Letters A. We even included the APOD in the references. Us not being astronomers, it is maybe no surprise that this was an APOD not showing a field of stars or nebulae. Therefore, I support that APOD once in a while shows pictures not strictly belonging to the field of astronomy but features our fascinating universe. Hey, that's great, Markus. That's actually a two-for-one-special showing how APOD can inspire such things and that it is also beneficial to sometimes include interesting pictures that are either vaguely or not really related to astronomy. This is an interesting topic and I look forward to reading hopefully many more posts. Last edited by geckzilla on Mon Sep 15, 2014 4:29 pm, edited 1 time in total. Reason: Changed idiom to a more appropriate one. No. But I was, and I am, absolutely flabbergasted by http://apod.nasa.gov/apod/ap140328.html showing star formation in gases stripped from a spiral galaxy. I attend a lot of talks on star formation at the Space Telescope Science Institute here in Baltimore, but no speaker yet has mentioned this incredible experiment performed by Mother Nature showing star formation in gas that has been stripped from a galaxy! Surely it is a Rosetta stone for the star formation process! 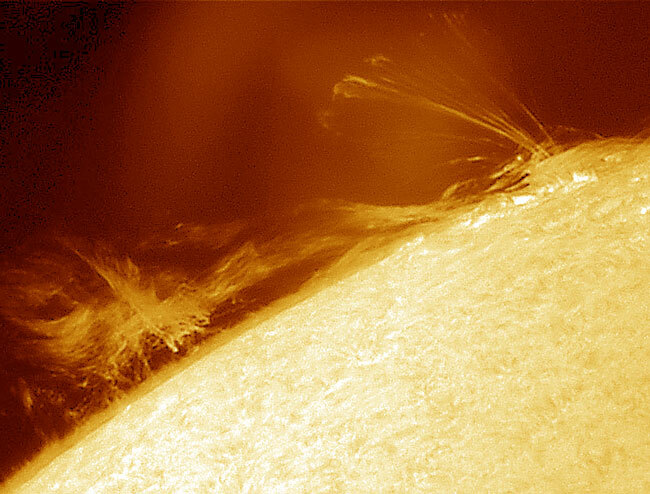 I analyzed the prominence shown in the APOD: http://apod.nasa.gov/apod/ap030707.html in my invesigation.